The local community supports the incorporation of facilities on a particular project. Provision of bicycle facilities will be considered on a case-by-case basis. If inclusion of bicycle facilities in a particular improvement is not appropriate, the conceptual study will discuss the factors considered in that decision. Many times bicycle traffic can be accommodated on the proposed improvement simply through the use of a paved shoulder or a shared lane. Bicycle facilities that are located off MoDOT right of way and adjacent to the project should be considered and appropriate connections made between the facilities whenever possible. Dedicated bicycle facilities will not be provided on the traveled lanes of interstate roadways. 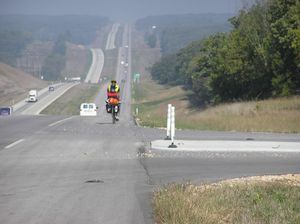 A bicycle facility may be provided along a non-interstate roadway that crosses interstate right of way if it is grade separated from the interstate traveled way. The bicycle facility crossing the interstate right of way should remain the same as the bicycle facility is on each approach to the interstate. For instance, if the bicycle facility is a designated bicycle lane on each approach to the interstate, then it should continue as a designated bicycle lane as it crosses the interstate roadway. Where special bicycle accommodation is not provided, bicyclists will use the travel lane. Therefore, probable use of the travel lane by bicyclists will be considered in determining appropriate construction details such as drain grates and expansion joints. Many times bicycle traffic can be accommodated on a proposed improvement simply through the use of a paved shoulder that has a minimum riding surface of four feet in width exclusive of any rumble strips. If this alternative proves unsatisfactory, several other types of facilities can be selected to address the bicyclist’s need. 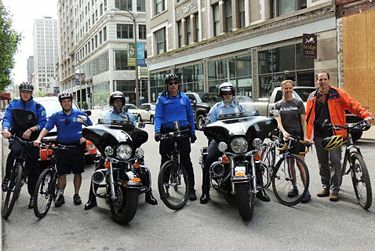 Numerous strategies are available to provide bicycle facilities along state roadways including: exclusive bicycle lanes, wide shared lanes, roadway shoulders, normal roadway lanes, and shared use paths. 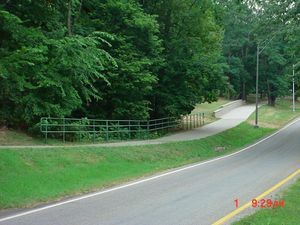 Typical roadway sections are available for use. A gutter section along the roadway is not considered a part of a bicycle facility. Similarly, roadway space with grate inlets is not considered a part of a bicycle facility. The AASHTO publication Guide for the Development of Bicycle Facilities 2012 and the FHWA publication Selecting Roadway Design Treatments to Accommodate Bicycles (FHWA-RD-92-073) provide excellent guidance for the design of bicycle facilities. Design and Planning Division personnel can provide further assistance in addressing project specific concerns on a case-by-case basis. The AASHTO Guide for the Development of Bicycle Facilities (2012) states, “All roads, streets, and highways, except for those where bicyclists are legally prohibited, should be designed and constructed under the assumption that they will be used by bicyclists”. See the AASHTO Guide for more detailed discussion on the planning and design of bicycle facilities. A typical roadway lane 12 ft. wide can be used to accommodate both motorists and bicyclists with a minimum of conflict when the vehicle operating speed and the volume of traffic, including trucks, is low. Paved shoulders often can adequately serve the needs of bicyclists. This treatment is well suited for rural roadway designs. In some situations, it may also be a viable alternative in urban areas. When paved shoulders are signed and marked for bicycle use, the “operating” width of the shoulder for the bicyclist will be a minimum of 4 ft. wide. A bicycle lane is a portion of a roadway that has been designated by signing and special pavement markings for the preferential or exclusive use of bicyclists. Bicycle lanes are well suited where bicycle travel and demand are substantial and vehicular traffic volumes and traffic speed are high. These lanes are most useful when located on urban collector and arterial roadways. A wide shared lane is a right hand through lane that is wider than 12 feet. A 14 ft. wide lane is the most common shared use lane. This “wide” lane can allow vehicles and bicycles to comfortably operate side by side in the same lane. In extremely congested areas, using a shared lane that is wider than 16 ft. may encourage the undesirable operation of two vehicles side by side in the shared lane. This type of lane is well suited for urban and suburban roadways with low vehicular and low truck traffic in situations where bicycle lanes are not feasible. A shared use path is generally a wide sidewalk located outside the traveled way. It is physically separated from vehicular traffic by an open space or a barrier. Preferably, it is located on independent right of way; however, if necessary, it may be located within the right of way. A shared use path is appropriate in corridors not directly served by highways or streets, such as along rivers, lakes, parks, abandoned utility or railroad right of way. Cross movement by vehicle traffic must be minimal. A shared use path in the public right of way must satisfy ADA requirements as published by the U.S. Access Board. Costs for new bicycle facilities, including right of way, construction and maintenance can be funded by MoDOT, local jurisdictions, by other non-department sources or by a combination of sources. Enhancement funds cannot be used for maintenance of bicycle facilities. Existing bicycle facilities disturbed by any MoDOT improvement will be replaced at MoDOT’s expense, unless superseded by provisions of a previously executed agreement or permit. Normal right of way and construction costs for this restoration will be included as a project cost for the proposed improvement. If funding as described in EPG 641.2 Costs is offerred by local jurisdictions or other sponsors, an agreement is necessary to address funding and maintenance responsibilities for bicycle facilities located either on or off MoDOT right of way. Detailed information concerning the sequence for preparing and executing a project agreement is available in EPG 235.2.3 Project Agreements. These agreements must be in place by the Plans, Specs and Estimates (PS&E) deadline for the project. MoDOT has legal liability for bicycle facilities located on MoDOT right of way. When others are responsible for maintaining a bicycle facility on MoDOT right of way, as provided in the agreement, MoDOT personnel will conduct regular inspections to ensure this maintenance is conducted. If the facility is not properly maintained, MoDOT personnel will take necessary steps to ensure needed maintenance is provided with the cost borne by the local sponsor as provided in the agreement. Articles in "641 Bicycle Facilities"
This page was last modified on 8 November 2018, at 09:04.